Not a great time to be a Charlton fan is it. As if losing to geographical rivals isn't bad enough, to do it with the eyes of the nation upon you, and to surrender without the trace of a fight is, quite frankly, embarrassing. Tuesday night saw the Addicks travel once again to Huddersfield, and once again The Terriers ran out victorious. Now I shouldn't judge some of our opponents on name and standing alone, but Huddersfield, really? They came up with us, looked certain fodder for the drop but appear to have developed a hold over us of late. They had a star striker, Jordan Rhodes, who seemingly single-handedly won them promotion, yet his high profile and very expensive move to Blackburn should have stopped them dead in their tracks, yet they continue to chalk up points and currently sit in a very healthy ninth spot. They can attract (and pay for) players of the calibre of James Vaughan, clubs like Huddersfield are in great danger of leaving us behind. We aren't one of the bigger fish like so many would like to believe, but are going to have to show resourcefulness and passion if we are to emulate the finish of the last campaign. At least a wonder strike from debutant loanee Cameron Stewart saved some face, the baby faced winger doubling his career goal tally in stunning fashion. 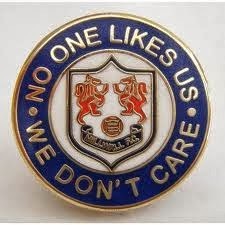 Good old Millwall, they're still on our level. A home tie against old rivals would show the belief and hunger come flooding back wouldn't it? Except London derbies don't really bring the best out in Charlton, mix that with the Sky cameras also in attendance and every jinx known in SE7 was put in place for a truly unmemorable game of football. True to form Charlton read the script. We lacked any goal threat, we consistently played square passes in very dangerous situations, standing off the opposition and letting them take a firm hold on the match. Many have tried to show some reason and justification with quotes of both sides being poor, the huge slice of luck with The Lions goal being the deciding factor. In truth though they looked far more hungry on the back of a good victory over Blackpool midweek. Nicky Bailey and Liam Trotter could pass the ball with conviction, a very impressive Martyn Woolford would run amok through our defence and they even had the audacity to bring on former Charlton loanee Lee Martin towards the end who also seemed to reap free reign of the attacking third. Woolford in particular ran at everybody, at one point beating two or three, getting tackled but regaining possession after being quickest to the loose ball. A very impressive showing from a player that clearly wanted three points from the match. Combined, our eleven didn't show as much devotion as Woolford alone, even the usually earnest Jackson appeared to be running on frustration rather than any positive emotions. As magical illusions go, you'd be hard pressed to see a better vanishing act than Charlton's desire, passion, zest and intensity. Even the young Stewart's late cameo couldn't revive any dignity this time around although he did finally send a ball or two into their keeper's six yard box at the death. Last night I enjoyed an evening with a difference, a local theatre hosted Morgan & West, two time travelling Victorian magicians. It was a great night of comedy and illusion, perfect for forgetting the agony of defeat. As clever as they were, and I seriously recommend catching them if you can during their Autumn tour, there is one trick I doubt even they could pull off, the near impossible and most daring of all known feats of wizardry, conjuring up a Charlton London derby victory.